Now you should have the de-randomized frame. Other of the things that were missing on the last part is the Data Error Correction. We already did the Foward Error Correction (FEC, the viterbi), but we also can do Reed Solomon. Notice that Reed Solomon is completely optional if you have good SNR (that is better than 9dB and viterbi less than 50 BER) since ReedSolomon doesn’t alter the data. I prefer to use RS because I don’t have a perfect signal (although my average RS corrections are 0) and I want my packet data to be consistent. The RS doesn’t usually add to much overhead, so its not big deal to use. Also the libfec provides a RS algorithm for the CCSDS standard. I will assume you have a uint8_t buffer with a frame data of 1020 bytes (that is, the data we got in the last chapter with the sync word excluded). The CCSDS standard RS uses 255,223 as the parameters. That means that each RS Frame has 255 bytes which 223 bytes are data and 32 bytes are parity. With this specs, we can correct any 16 bytes in our 223 byte of data. In our LRIT Frame we have 4 RS Frames, but the structure are not linear. Since the Viterbi uses a Trellis diagram, the error in Trellis path can generate a sequence of bad bytes in the stream. So if we had a linear sequence of RS Frames, we could corrupt a lot of bytes from one frame and lose one of the RS Frames (that means that we lose the entire LRIT frame). So the data is interleaved by byte. The image below shows how the data is spread over the lrit frame. // Copy parity - Not needed here, but I do. In the variable derrors we will have how many bytes it was corrected for each RS Frames. In rsCorrectedData we will have the error corrected output. The value -1 in derrors it means the data is corrupted beyond correction (or the parity is corrupted beyond correction). I usually drop the entire frame if all derrors are -1, but keep in mind that the corruption can happen in the parity only (we can have corrupted bytes in parity that will lead to -1 in error correction) so it would be wise to not do like I did. After that we will have the corrected LRIT Frame that is 892 bytes wide. Now we will demux the Virtual Channels. I current save all virtual channel payload (the 892 bytes) to a file called channel_ID.bin then I post process with a python script to separate the channel packets. Parsing the virtual channel header has also some advantages now that we can see if for some reason we skipped a frame of the channel, and also to discard the empty frames (I will talk about it later). Replay Flag – Is 1 if the frame is being sent again. Basically we will only use 2 values from the header: VCID and Counter. I usually save the last counter value and compare with the current one to see if I lost any frame. Just be carefull that the counter value is per channel ID (VCID). I actually never got any VCID higher than 63, so I store the counter in a 256 int32_t array. One last thing I do in the C code is to discard any frame that has 63 as VCID. The VCID 63 only contains Fill Packets, that is used for keeping the satellite signal continuous, even when not sending anything. The payload of the frame will always contain the same sequence (that can be sequence of 0, 1 or 01). Having our virtual channels demuxed for files channel_ID.bin, we can do the packet demuxer. I did the packet demuxer in python because of the easy of use. I plan to rewrite in C as well, but I will explain using python code. Each channel Data can contain one or more packets. If the Channel contains and packet end and another start, the First Header Pointer (the 11 bits from the header) will contain the address for the first header inside the packet zone. We have a 6 byte header containing some useful info, and a user data that can vary from 1 byte to 8192 bytes. So this packet can span across several frames and we need to handle it. Also there is another tricky thing here: Even the packet header can be split across two frames (the 6 first bytes can be at two frames) so we need to handle that we might not have enough data to even check the packet header. I created a function called CreatePacket that receives a buffer parameter that can or not have enough data for creating a packet. It will return a tuple that contains the APID for the packet (or -1 if buffer doesn’t have at least 6 bytes) and a buffer that contains any unused data for the packet (for example if there was more than one packet in the buffer). We also have a function called ParseMSDU that will receive a buffer that contains at least 6 bytes and return a tuple with the MSDU (packet) header decomposed. There is also a SavePacket function that will receive the channelId (VCID) and a object to save the data to a packet file. I will talk about the SavePacket later. print "   Multiple packets in same buffer. Repeating." # Data was incomplete on last FHP and another packet starts here. print "   Data was incomplete from last FHP. Parsing packet now"
# some data to add. # Since we have a FHP here, the packet has ended. We just need to append the data to last packet. We lost some frame (or we just started) and we got a continuation packet. So we drop it. # a continuation packet, so we drop. # We have a last packet, so we append the data. Now let’s talk about the SavePacket function. I will describe some of the stuff here, but there will be also something described on the next chapter. Since the packet data can be compressed, we will need to check if the data is compressed, and if it is, we need to decompress. In this part we will not handle the decompression or the file assembler (that will need decompression). Now that we have the handler for the demuxing, we will implement the function SavePacket. It will receive two arguments, the channel id and a packetdict. The channel id will be used for saving the packets in the correct folder (separating them from other channel packets). We may have also a Fill Packet here, that has an APID of 2047. We should drop the data if the apid is 2047. Usually the fill packets are only used to increase the likely hood of the header of packet starts on the start of channel data. 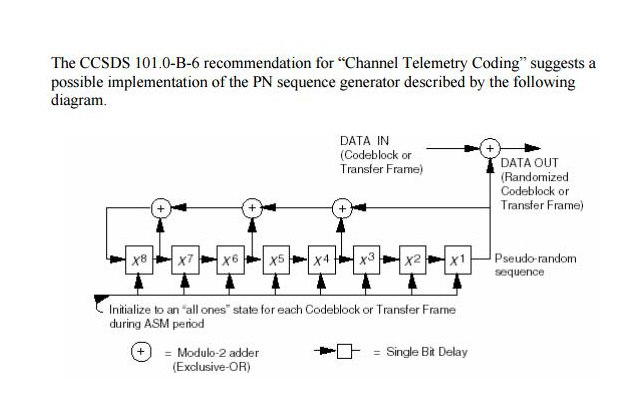 So it “fills” the channel data to get the header in the next packet. It does not happen very often though. 0 => Continued Segment, if this packet belongs to a file that has been already started. It also contains a packetnumber that we can use to check if we skip any packet (or lose). print "  Fill Packet. Skipping"
print "   WARNING: Some frames has been droped for this packet." print "   WARNING: CRC does not match!" print "   Corrupted frame, skipping..."